Performers include: Titus Welliver, Jamie Hector, Amy Aquino, Lance Reddick, Madison Lintz, Gregory Scott Cummins, Troy Evans, DaJuan Johnson, Scott Klace, Deji LaRay, Steven Cult, John Eddins, Sarah Clarke, and Jeri Ryan. 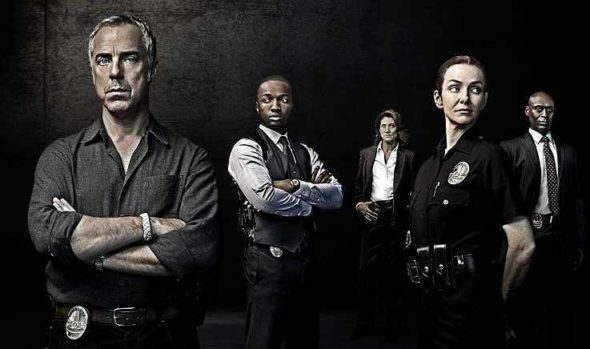 Based on the Michael Connelly book series, the Bosch TV show follows dogged Detective Hieronymus ‘Harry’ Bosch (Welliver), of the LAPD’s Hollywood Homicide Division. Although something of a rebel, this military veteran who served in both Iraq and Afghanistan, understands why there are rules, and when to skirt them. The son of a murdered prostitute, Harry was orphaned at a young age. Her murder long went unsolved, because the department and the D.A.’s office protected the murderer. Bosch partners with Detective Jerry Edgar (Hector). They report to Lieutenant Grace Billets (Aquino), with whom they share a friendship. Their West Bureau Commanding Officer is Deputy Chief Irvin Irving (Reddick). Harry sold the rights to the story about one of his cases, and served as technical advisor on it, for which he earned enough money to buy a house in the Hollywood Hills. Although it can be strained sometimes, Harry and ex-wife Eleanor Wish (Clarke) have an amicable relationship. They also share a teenaged daughter, Maddie (Lintz), with whom he is close. His work has been known to put them in jeopardy. Once, while in pursuit, Harry shot and killed a suspect. Although the LAPD cleared him, eventually the man’s family sued him for wrongful death. One of his cases involved the skeletal remains of an abused boy who was ultimately buried in the woods. Other cases include the murder of a Hollywood producer who once laundered money for the mob and tracking serial killer Chilton Hardy (Brad Carter). Bosch is always seeking justice despite the imperfect system of which he is a part. What do you think? Do you like the Bosch TV show? Do you think it should be cancelled or renewed for another season? I didn’t know about the show till my wife started watching. Then we binge watched all the seasons in two days. Great show. Can’t wait for the new season. Would like to see more Goliath and Sneeky Pete too. One of the best cop shows. Maybe the best. Too much coarse language. Do you have any idea how cops speak when there isn’t a camera around? Love the novels. Love the TV series. Great show. Hope it continues. I have read all the books and so enjoy the show. Keep it going. Love Bosch. It is entertaining with in depth characters and realistic storyline . Where’s Season 5? We love the show and look forward to each and every show. I want it to be a weekly series with no breaks. Hard on the whole group but it is not my fault they make such an exciting, edgy, and engrossing series. The first 4 seasons barely equals half a season. Do you get the hint, MAKE MORE SHOWS! Please do not cancel one of my favorite shows. I watch it faithfully and is one of the reasons I keep my Amazon Prime. Too many shows are being cancelled like SIX. Bosch is an excellent show with fantastic plots and acting. Keep it going!! !